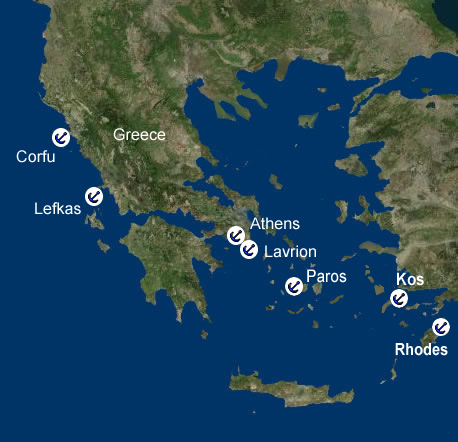 You have the entire Ionian to play with when creating your perfect itinerary on this Greek Yacht Charter. 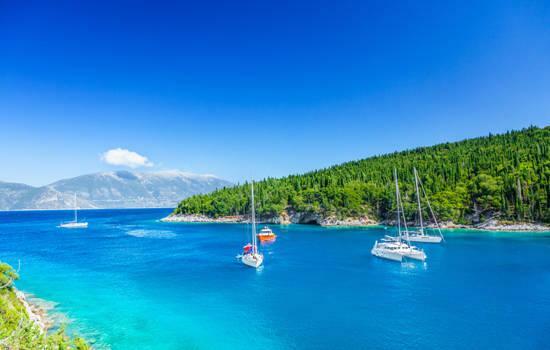 Between Corfu and Kefalonia you will find idyllic anchorages, from quaint fishing villages with traditional tavernas to the more lively resorts that will get you partying with the rest of them. Your Greek charter itinerary can provide you with short hops or longer distance sailing but whichever you choose there's a fantastic choice of activities awaiting you in the Ionian. The base in the southern Ionian, and the starting point for your Vounaki yacht charter, is Vounaki, a small marina located just south of the town of Paleros. Vounaki is situated at the foot of the Arkanika Mountains and the marina is a short 15-minute walk from Paleros, a seaside town that has a number of good tavernas along the waterfront serving locally caught fish - bream, bass and octopus are amongst the most popular - and other local specialities. The shops in Paleros offer a wide selection of goods and there's an ATM in the town. During the summer months, you might see cultural events such as puppet shows, theater performances or displays of traditional Greek dancing in the town square. Walk up the mountain behind the marina, where the scent of oregano and wild thyme lingers in the air, to visit the monastery of St. Dimitrios, considered by the locals to be the protector of Paleros and its people. It is arduous, but worth it for the views when you get there. Mooring: Stern-to mooring berths are available. Vathi, the main port and the capital of the island of Meganissi and of Ithaca, is a picturesque fishing harbour known for a few good tavernas, a couple of shops and its traditional charm. The Rose Garden serves what's considered to be the very best taramasalata to be found in these parts (the last time we were there, a large party of Greek Orthodox priests in full regalia was tucking into a huge feast at The Rose Garden) and Yeorgiou's has great fresh fish (try the octopus - it's fantastic!). There are pleasant walks to be taken through the olive groves to the east of the village and there's a small playground for children. The metropolis (ha!) of Vathi is an ideal stop-over on a Vathi boat charter after a lazy day spent swimming or snorkeling in one of the nearby bays such as Abeliki or Kapali. Vathi is close to the Onassis-owned twin islands of Skorpios and Skorpidhi, which Aristotle Onassis bought in the 1960s. You cannot set foot on the islands, but you can sail around them and there are a few anchorages off their shores. When Onassis himself was there, he never slept on the island, preferring the comfort of his yacht, the Christina . There is a little 'beach hut' on the south-west shore of the island that Jackie Onassis had built for herself so that she could swim in the crystal clear waters of the cove. Onassis and his two children are both buried on the island, which is now owned by Aristotle's granddaughter Athine and is still carefully maintained. Mooring: At Vathi, stern or bows-to mooring on the harbor wall where you can find space. Vassiliki Bay on the southwest coast of Levkas island is the place for windsurfing. The brisk afternoon wind that blows off the hills has made Vassiliki a place of pilgrimage for board-sailors and is said to be one of the ten best in the Mediterranean. The wind here is popular that even has a name, Eric! It's a relaxed waterfront town with plenty of good tavernas lying in the shade of the trees and is a charming place to visit on a Vassiliki boat charter. Bounded to the west by the rugged hills of Cape Doukato, the limestone cliffs that give Lefkas its name and from which the poet Sappho is said to have leapt to her death after having been spurned by her lover, Vassiliki is a wide and sheltered bay that is happening place in summer with many onshore activities to keep the troops entertained. In July and August you can expect to find windsurfing competitions, beauty pageants and plenty of fun. There's even a disco so get your dancing shoes ready. Mooring: You can anchor at the head of the bay in 6 - 16 feet (2 - 5 meters) on sand and weed, which is comfortable in moderate winds, but not if there are strong gusts. In the inner harbor, you can moor stern or bows-to on the west or south quays but be aware of silting - yachts drawing 6 feet (2 meters) or more should be especially careful. The east quay of the outer harbor is an alternative. Here, skippers will want to ensure that their anchor is well in and should lay a second anchor as the prevailing wind blows straight in. Kefalonia is the largest Island in Greece's Ionian sea, with a mountainous interior covered in pine and cypress forests. It is a landscape made famous by Louis de Berniere's book 'Captain Corelli's Mandolin' (and the film version starring Nicholas Cage), as you sail around the island, impressive mountain scenery is your backdrop. The island's interior is well worth exploring by bike, car or jeep, all of which are available to rent in Fiscardo. Cephalonia has, at various times, been in Roman, Norman, Pisan, Turkish, Venetian, French and English hands and was occupied for a time by the Italians. Now Cephalonia is Greek, although there remains a definite Italian feel. Fiscardo, located on the north-eastern tip of the island, and marked by an impressive Venetian lighthouse on the north side of the bay, is one of the few villages that survived the 1953 earthquake (almost unscathed) and its 19th century Italianate architecture remains intact. Fiscardo itself is a gem of a seaside town, with much to appeal to the visiting sailor. It's quite the place to see and be seen, sometimes referred to by some as 'Kensington by the Sea'. In summer it is very popular and moorings can be in short supply as sailors gravitate to the shops, boutiques, tavernas and nightclubs of the pretty harbor. The Captain's Cabin on the waterfront is something of a yachtsman's gathering place for early evening drinks, while Herodotus and the Garden Taverna come recommended for their delicious food. Fiscardo is a good place from which to explore the fortresses, monasteries, museums and hiking trails of the northern part of the island. It is also within easy reach of some wonderful snug and secluded coves with crystal clear waters, ideal to anchor for an afternoon of swimming, snorkeling and relaxation. Mooring: Berth stern or bows-to on the town quay where possible. There is a pontoon run by Tassia's Taverna on the west side of the harbor. When the quay is full, anchor and take a long line to the shore on the north side, keeping well clear of the ferry berth. The bottom is sand, mud and weed with a few scattered rocks, holding is good once through the weed. What do you want to do today? You can put your sailing skills to the test and go for a big sailing adventure, sail to a secluded bay for some lunch, go to the nearest town for a spot of shopping, or simply relax where you are, it's entirely up to you. Mooring: The bay is relatively deep - 26-40 feet (8-12m) - rising abruptly to the shore. The best strategy is to anchor and take a long line ashore to a tree or a rock. The bottom is mud and weed with decent holding once you get through the weed. During the day, the bay is relatively sheltered but in the evening a katabatic wind from the north east can make things a little uncomfortable. The base in the southern Ionian, and the starting point for your Vounaki yacht charter, is Vounaki, a small marina located just south of the town of Paleros. Vounaki is situated at the foot of the Arkanika Mountains and the marina is a short 15-minute walk from Paleros, a seaside town that has a number of good tavernas along the waterfront serving locally caught fish - bream, bass and octopus are amongst the most popular - and other local specialities.